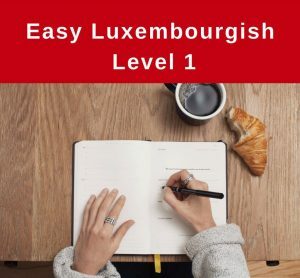 One of the most challenging aspects of learning Luxembourgish, at least initially, can be the fact that each pronoun (personal, possessive etc) and each article has three cases. 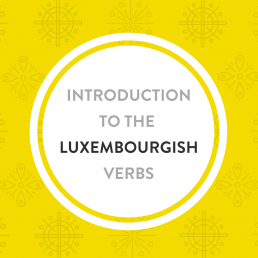 The three Luxembourgish cases are the nominative, dative and accusative. 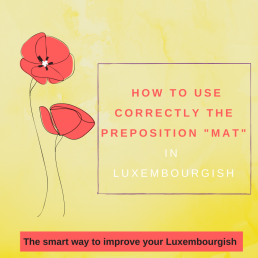 Fortunately, the Luxembourgish articles and the possessive pronouns are the same in the accusative case as in the nominative case. The case explains which function a noun or a pronoun (ech, du, mir …) has – whether it’s the subject, or an indirect or a direct object – and how the noun relates to the other words in the sentence. Depending on where a noun or pronoun lands in a sentence that pronoun changes, as does the article preceeding a noun. The nominative case is the subject of a sentence. The subject is the person or thing that is active in the sentence or is central to the interest (who or what is doing something). It is the word that tells you how to conjugate the verb. The question for the nominative case is wien (who) or wat (what)? De Jong spillt Ball. – The boy is playing ball. De Jong is the subject and third person singular ⇒ „spillt“. D’ Wunnenge sinn deier an der Stad. – The flats are expensive in Luxembourg city. D’Wunnengen is the subject and third person plural ⇒ „sinn“. The accusative case is known as the direct object. The direct object is the person or thing that is acted upon (that receives the action). In the accusative case you have the subject and the direct object in a sentence. 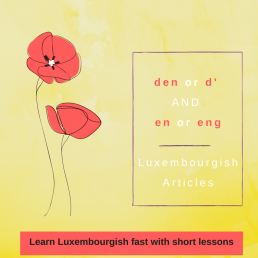 In Luxembourgish, the articles do not change in the accusative case, i.e. they are identical to the nominative. Dir musst d’Medikament zweemol den Dag huelen. – You have to take the medicine twice a day. Ech wëll hien eppes froen. – I want to ask him something. The dative case is known as the indirect object. The indirect object (dative) is usually the receiver of the direct object (accusative). The articles and pronouns change in the dative in all genders correspondingly. The dative is also used after certain dative verbs and with dative prepositions. In the examples below, the subject is black, direct object noun or pronoun (accusative) is in red and the dative article is and the dative word are in bold. De Polizist gëtt dem Chauffer e Protokoll. – The policeman is giving the driver a ticket. Dir sollt Waasser mam* (mat dem) Medikament drénken. – You should drink water with the medicine. Ech muss dir eppes Wichteges soen. – I have to tell you something important. ⇒ soen is a verb which requires the dative case. 1 D’Fra weist dem Jong d’Buch. – The woman shows the book to the son. 2 Chrëschtdag schenken ech menger Mamm e Kaddo. – I’ll offer a present to my mother on Christmas. Watch the lesson on Youtube to check whether you’ve got the correct answer!